I've been slowly working on improving my sewing workspace this year, and am finally in a place I think it will work well for me. Key things I had to work with for this: try and keep my grandmothers desk, keep the shelving in place (taking down shelves and moving fabric is a pain! and a total of $100 for new things. My main problems was with quilting, and the drag that was created by shoving too much quilt over my tiny desktop. So I went to Ikea's As-Is section and got a piece of wood to extend the tabletop. I decided I needed more storage in my room anyways, so I also got the bookcase to support the tabletop from the As-Is. Anyways, I topped the extension table with a home-made pressing board, and voila. 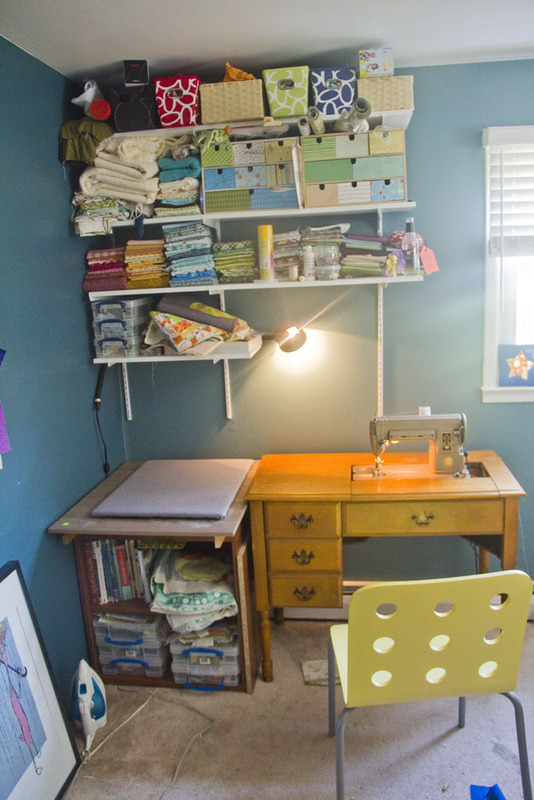 sewing space that works for me instead of against me! And total cost: $50 bucks. Score! I tested out the extension table by pulling out my chicopee quilt to be quilted, and it works like a charm! it really cuts down on me fighting the drag of the quilt, which makes quilting a lot more enjoyable! Next up is making an actual design wall, instead of the (too small) piece of batting thumbtacked to the wall..
A Quilt all for MEEEEEE!